Technical / Professional courses at Under Graduate / Post Graduate level or short term courses under recognized Institutes of West Bengal and other states of India. Details of eligible courses may be seen at WBMDFC’s website www.wbmdfc.org . 2. His/ Her annual family income should not exceed Rs 81000/- in rural areas and Rs.103000/- in urban areas. 4. His/her age should not more than 32 years. 5. Applicable with @ 3 % interest charged per annum. ** Students who are applying for the first time will have to submit application as fresh candidate. 1. The eligible students are to apply Online at wbmdfc.net and after finalizing print out a hard copy. 2. Students are required to submit duly signed the printed version of their online applications to their respective institutes for verification of information given in the online application. The hard copy of the online application is to be certifying by the head of the respective institute and student will submit the authenticated to WBMDFC’s Head Office. 3. CBS Bank Account to be opened jointly in the name of student and parent or legal guardian, if selected. 4. Eligible students are required to provide eligible guarantors and execute other relevant documents, if selected. 5. The hard copy of the online application will be submitted duly signed by the Institute along with undernoted documents. (i) Fees Structure & Bonafide certificate from college and age proof (Madhyamick Admit Card) of the eligible student. (II)Annual family Income Certificate from MP/MLA/SDO/BDO/Pradhan/Councilor or Chairman of the concerned Municipality. (III) Self attested copy of Marks Sheet of the last qualifying examination of the Board/ University. 6. 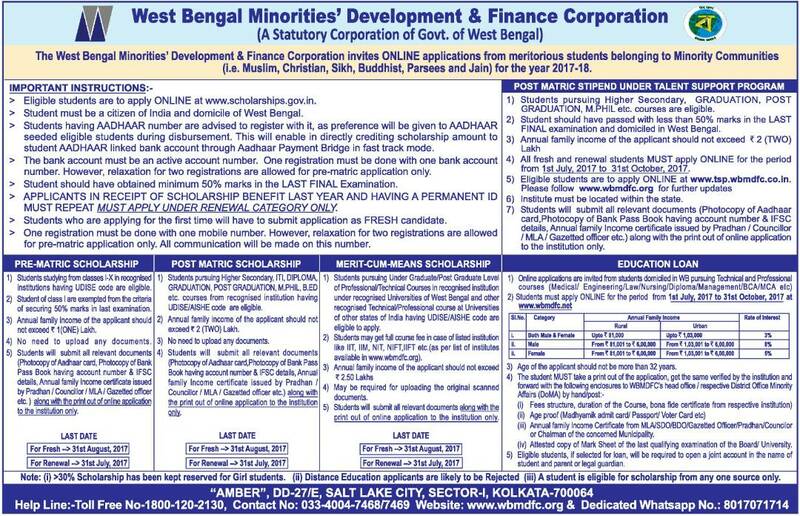 Date of submission of hardcopy of online application is up to 31.10.17 Details may be seen at WBMDFC’s website wbmdfc.org or contact the Enquiry Office of WBMDFC.’s HO. 7. Only Technical and Professionals course is Eligible for Education Loan. I have applied for Education Loan 2017-18 for Rs. 3,00,000/- dated on 29-07-2017 and Registration Number MDFC/17-18/27535. But still I have no response in this matter, awaiting your early reply. I am a MBBS student who is studying in abroad. I want to get education loan. So what can I do? I’m B.Tech 2nd year student. I want to know when you will start 3% annum interest after completed the course. I just want to know that whether education loan is applicable for those students who are studying in abroad. Technical / Professional courses at Under Graduate / Post Graduate level or short term courses under recognized Institutes of West Bengal and other states of India. Details of eligible courses may be seen at WBMDFC’s website wbmdfc.org .